This is one liberating 2016. With the majority of us looking at the New Year as a fresh start in some capacity of our lives, it's always helpful to get some encouragement from an outside source. Whether it be family, friends or co-workers, we can always use a little championing now and then. 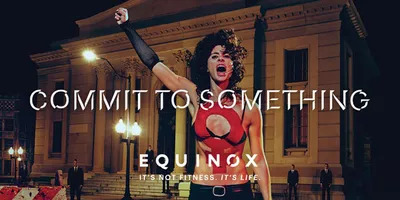 Equinox is going bold with their New Year's cheerleading routine, promoting a movement that wants to celebrate every hard-won, challenging, fearless moment in your life. Their Commit to Something campaign is edgy and fierce, complete with glossy, provocative photos shot by famed photographer Steven Klein. Proving they're about more than just fitness, the empowering images include Lydia Hearst as a mom breastfeeding in public and Bianca Van Damme (yes, that would be the daughter of Jean-Claude) as a passionate activist. "It is the responsibility of advertising to communicate modern times and social issues," says Klein in a statement. "This campaign addresses today's issues and social commentaries, which is a powerful approach instead of portraying people as superficial objects with no narrative." And if the hair looks particularly on point, Chris McMillan is responsible. So, you know, it's to be expected. 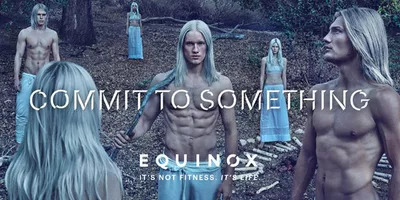 So whether your goal this year is to tackle a personal health challenge, stand for something you believe in, or pave your own way to better future, Equinox has your back.